Amnesia is a pet peeve of mine…mainly because of Korean Drama. Okay- my annoyance at amnesia is exclusive to k-drama land. An often utilized plot twist, a rarely well executed story point, amnesia makes me shudder. I have to eat my words this once and congratulate Kim Kang Woo at pulling it off- you made amnesia okay. At least for 16 episodes. Tae Sung burst onto the scene of this drama as a dedicated and by-the-book prosecutor. This man was so dedicated to his work he barely made his own wedding and skipped out on his ill wife in the name of justice. At first glance, this character was set up as the morally upright super man with little to endear him. Upon further acquaintance Tae Sung proved to be a complex character with motives that were buried deep within a suffocated soul. Tae Sung’s saving grace was his amnesia. A violent incident that was caused by his stoic dogmatism, the blow to the head that resulted in memory loss introduced him to the world he needed the most, the world where he was no better than anyone else. No longer a prosecutor, no longer a title and a background, this character experienced love and happiness for the first time in his life in the only way possible- as a man who had no background or inherent prestige- a free soul without a past. This drama layered on the melodramatic plot points in comedic fashion. Tae Sung alone experienced amnesia, forbidden love, finding his birth family and ostracism by his social class. Normally I would laugh at the laundry list of clichés but in this case I swallow my giggles with appreciation. The character of Tae Sung kept his own personality traits while plodding through the melodramatic and often comedic circumstances that were thrown at him. Tae Sung was Tae Sung, even though he was really a gangster’s son, or the husband of a gangster’s daughter, or a disgraced prosecutor. This character grew in three steps- Tae Sung the prosecutor, Nam Hae the bodybuilder, and finally Tae Sung the prosecutor / hotel heir. Throughout the phases this character went through we stuck to his core principles. 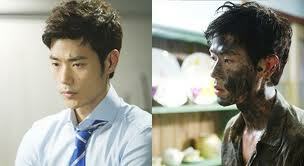 Tae Sung remained Tae Sung, to the point where his overall character maturity depended on him finding his true self. Tae Sung was the same person from beginning to end, a man that had to discover for himself that he should stand up for his own happiness. A pawn in a game of family, Tae Sung lived for approval until he found the one thing he could not give up to make everyone else happy- So Ra. An unlikely end for such a dutiful son, but an awesome moment in regards to character growth. For that I declare Tae Sung a great character indeed.